When we drum together, we build community ONE beat at a time! Our dedicated and passionate team are helping build and restore communities, empower, and heal individuals ...ALL to the beat of the drum! Hosting an Afrobeat Interactive drumming experience is a great way to give back to your community, strengthen your team dynamic, and foster friendship and support. 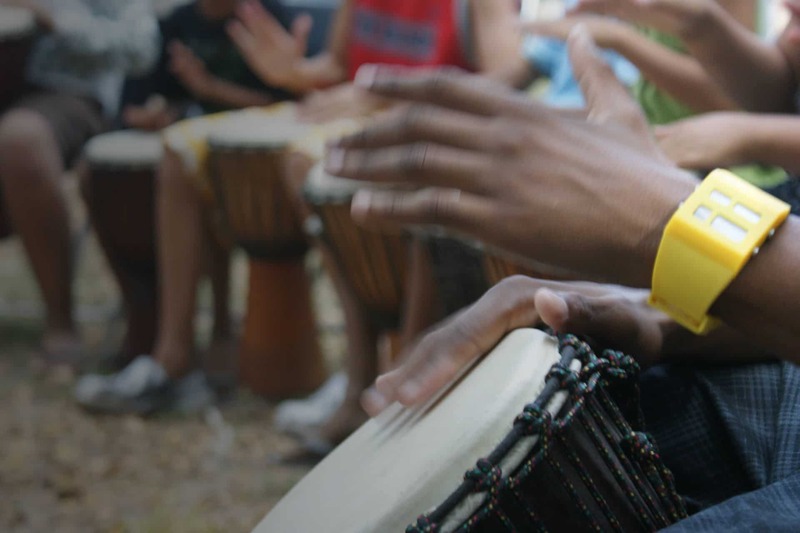 The experience of drumming together helps remove social barriers in a non-intimidating, and fun atmosphere. Participants relax, gain enthusiasm and the necessary confidence to fully participate in other activities together. Get people talking and feeling good about themselves and their community! Afrobeat creates an atmosphere of fun, success, and being part of something special. Participants learn the art of working together without words, building dynamic sounds and polyrhythmic compositions traditional to African Music, leaving them uplifted, energised and inspired! We LOVE what we do and we do it with genuine joy and compassion. These traits along with our specialised skills and training; and 20 years experience working with diverse people and group dynamics makes us a popular choice for clients looking for something unique, inspiring and appropriate for their group or community event! …’Totally Wild’ to film a story on African Drumming. It was an extremely exciting time, bringing a community of young people, parents & workers together. Janine is very sincere & genuine & has the ability to energise a group of people & inspire them to share with her the wonderful rhythms & dances of Africa. Brilliant! We had a much needed laugh at ourselves. We were impressed with Janine’s performance & standard of professionalism towards her work. The young people were very enthusiastic toward her and the skills she had to offer. Janine possesses excellent communication skills and has no difficulties relating to people at all levels. Her methods of teaching were very simple & easy to understand.